What’s holding you back from learning a language? 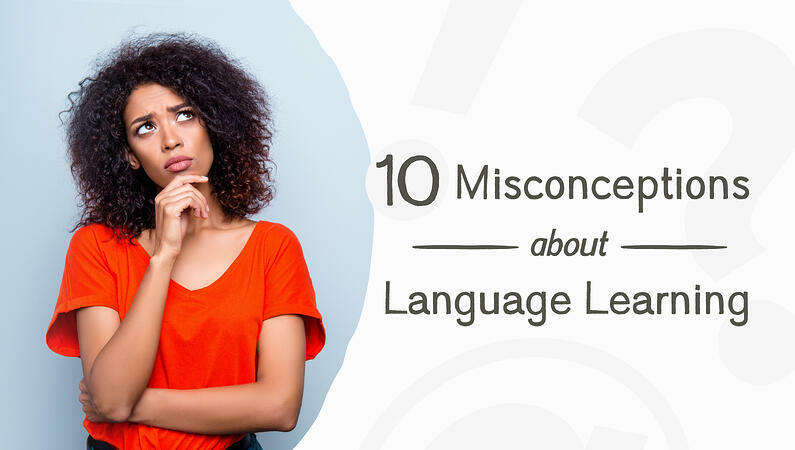 If it’s any one of these 10 misconceptions about language learning, you might want to reconsider. Many people want to learn a new language but think that they will never be able to due to these 10 pervasive, but not completely accurate beliefs. Let’s dive in and take a look at how with time, effort, and the right resources — anyone can learn a language! While there is indeed a clear advantage to starting earlier, adult language learners can become native-like speakers of their target language too. Recent research indicates that many learners who started after the age of 20 performed just as well as those who began their learning as children. So, it’s never too late! Research has found that older children are better language learners in a school setting, but younger children may have an advantage in learning correct pronunciation. In fact, MIT scientists found that the language-learning advantage extends all the way up to age 18, which is later in life than previously thought. Different learning preferences and cultural communication methods have an impact on language learning, just as they do on other types of learning. What’s important is that you find out what works for you. The idea that English is the language of business and international communications is common, especially among English-speaking countries. While English is certainly spoken as a second (or third, or fourth) language by many people, the idea that everyone speaks English is false, and could give countries like the United States a social and economic disadvantage in our increasingly globalized, competitive economy. Learning another language will give you a unique set of skills that will not only boost your job opportunities, but change your life in other areas as well. According to a recent survey, the typical American language-learning experience in middle school or high school classrooms does not produce multilingual students. So, depending on where you are from (the European education system produces a much higher percentage of multilinguals), continuing your world language education after graduation is a must in order to reap the benefits of multilingualism. While language learning certainly takes time and effort, it’s also true that some languages are easier to learn than others! It all depends on two conditions: your native language and your level of commitment. Linguists believe that finding a language as close to your native tongue as possible can make language learning easier. In addition to this, setting clear goals, consistent practice, and staying motivated are all things that can propel you forward towards language-learning success. While we all have different talents, the great thing about language learning is that anyone who wants to learn, can learn. Just take Luxembourg for example. Over 50 percent of the adult population reported that they can speak three or more languages — they can’t just all be gifted at languages, right? When it comes to learning, it’s about attitude over aptitude, and of course, perseverance. Thanks to the internet, language content is available to anyone with a computer, tablet, or phone. Where you live is not an obstacle — you simply have to find the right resources. Theoretical grammatical explanations can be difficult to understand, even harder to remember, and challenging to put into use, but learning at your own pace (with a resource made by native speakers and language instructors that provides both grammar and cultural explanations) can help guide you toward a better understanding of new concepts and cultures. With Bluetooth capabilities, downloadable lessons, and hands-free learning options, you can adapt your study time to your own personal schedule using Mango's mobile app. Start off with just a few minutes a day, and before you know it, you’ll have hours of study time under your belt. If you believe you will achieve significant results, and if you enjoy doing it, you will find the time! So what are you waiting for? Jump back into your most recent Mango lesson, or get started by choosing one of our 70+ world languages and 20+ ESL/ELL courses. Click the link below to start learning. Can you think of any more language-learning myths that need debunking? Share them with us in the comments!